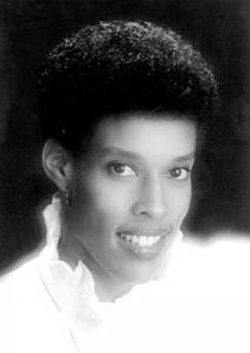 Hyman, Flora “Flo” (31 July 1954 - 24 Jan. 1986), volleyball player, was born Flora Jean Hyman in Inglewood, California, to George W. Hyman, a railroad janitor and supervisor, and Warrene Hyman, the owner of the Pink Kitty Café. As a child Flo was self-conscious about her rapid growth--she stood six feet tall in junior high school--although her mother, who was also tall, encouraged her to be proud of her height and precocious athletic talent. Though she could have starred in basketball or track, in her sophomore year she took up volleyball, a game played primarily by affluent whites in nearby Redondo Beach, not by African Americans in working-class Inglewood. In 1974 the strength and athleticism Hyman showed as a high schooler playing for the South Bay Spoilers earned her a place on the U.S. national volleyball team. That same year, University of Houston volleyball coach Ruth N. Nelson awarded her the first athletic scholarship ever awarded to a woman at the college; Hyman characteristically refused to accept the full amount of the award so that some of her teammates might also benefit. She studied mathematics and physical education and received several honors, most notably the 1976 - 1977 Broderick Sports Award from the Association of Intercollegiate Athletics for Women. In 1977, after being acclaimed the nation’s top collegiate player and one of the world’s outstanding players, Hyman decided to forego her senior year to practice and play full-time for the U.S. national team in preparation for the 1980 Olympics. Under Dr. Arie Selinger, a demanding but inspirational coach, Hyman hoped that the United States could match the sport’s most dominant nations, though unlike Japan, the Americans lacked major corporate sponsorship, and unlike China, they lacked state support and a talent pool of ten million players. Indeed, while basketball’s WILT CHAMBERLAIN had vigorously promoted volleyball, most Americans ignored the sport, and the television networks showed no interest in broadcasting any women’s team events. The American team made up for these deficiencies with a strong sense of camaraderie, which was sorely tested when the United States withdrew from the 1980 Moscow Olympics to protest the Soviet Union’s invasion of Afghanistan. The Americans’ absence from Moscow denied the team a major stage upon which to display its talents, but the global volleyball community took note of Hyman’s skills at the 1981 World Cup, where she was selected the tournament’s outstanding player, and at the world championships in 1982, when she led the United States to the bronze medal. American sports fans began to pay attention, too. At six feet, five inches tall, Hyman was the nation’s most intimidating offensive player, able to spike a volleyball as fiercely and accurately as her contemporary, Julius Erving of the Philadelphia 76ers, dunked a basketball. On defense, her rangy, angular frame was initially a handicap, but she overcame her reluctance to throw her body to the floor when required and soon mastered the backcourt as well. According to sports journalist George Vecsey, Hyman was also one of the most charismatic athletes of her generation. Yet if Hyman’s dominance in women’s volleyball in the 1980s was as great as MICHAEL JORDAN’s ascendancy in basketball a decade later, her celebrity and financial rewards never came close to those of even journeymen NBA players. Buoyed by corporate sponsorship and the patriotic fervor that accompanied the 1984 Olympics in her hometown of Los Angeles, Hyman led the U.S. women to unprecedented public acclaim and a silver medal. Having devoted ten years of her life to volleyball--often cutting short the brief vacations she allowed herself--Hyman earned plaudits for her dominating performance and for her magnanimous praise of the gold-medal-winning Chinese team. Hyman made the most of the fame that the Olympics had granted her, joining civil rights leader CORETTA SCOTT KING, astronaut Sally Ride, and vice-presidential candidate Geraldine Ferarro at a women’s rights rally during the 1984 elections. American interest in women’s volleyball proved fleeting, however, and Hyman returned to Japan, where she had begun to play professional volleyball for the Daiei team in 1982. By 1986 she had transformed Daeie, a struggling minor league team sponsored by a supermarket chain, into a leading force in Japan’s major volleyball league. Hyman remained a fierce competitor, though her coaching skills and ability to read the game now mattered as much as her play on the court. Indeed, to many it seemed fitting that Flo Hyman’s final words were an exhortation to a teammate, uttered shortly before she collapsed near the end of a match in Matsue City, Japan, in late January 1986. Hyman died later that evening from what was first reported as a heart attack, but later announced as complications resulting from Marfan syndrome, an hereditary disorder that often leads to a fatal rupturing of the aorta. Hyman displayed one manifestation of the syndrome, her height, but did not suffer the more telling signs of the disorder, notably curvature of the spine or breastbone. As a consequence her condition was never diagnosed, though her death helped to publicize Marfan syndrome and has encouraged athletes and others at risk from the disorder to be tested. Hyman, who never married, was buried at Inglewood Park Cemetery in her hometown, and was survived by her father, who died three years later, and eight siblings. Her posthumous awards have been many: she was inducted into the Volleyball Hall of Fame in 1988 and named by USA Volleyball as the MVP for the years 1978 - 2002. She was also the first woman admitted to the University of Houston’s Hall of Honor in 1998. Demak, Richard. “Marfan’s Syndrome: A Silent Killer,” Sports Illustrated, 18 Aug. 1986. Vecsey, George. “America’s Power in Volleyball,” New York Times, 2 Oct. 1983. Obituary: New York Times, 25 Jan. 1986. ©2007-2019 brvc, LLC. All Rights Reserved.